I have been encouraging as many people as possible to learn to crochet. It is such a rewarding hobby (and it can even turn into income!) with so many physical and emotional benefits. The repetitive motion of crochet is very therapeutic and calming. I relax and unwind each night with my hook and yarn while the hubby watches some TV. I have 4 kids, so most days, I really need some unwinding 😉 Unfortunately, I hear so many people say that their experience with crochet was the complete opposite of calming. They became frustrated and gave up. In most of these cases, the problem is that the wrong skill level pattern was chosen. When one begins with a pattern properly suited to the correct skill level, the first project becomes much more successful. It might not be the photo you admire on Pinterest, but you will gradually develop your skills until it’s YOUR photo that goes viral on Pinterest. So here are some great patterns that I recommend for beginners. The patterns are well written and I know these designers personally. They will gladly give pattern support, if needed. And YouTube is a great resource too! An Apple Cozy by Accessorise is a very nice small project to test your skills and everyone needs a bruise-free apple! The Beary Cute Beanie by Danyel Pink Designs is a great project to practice working in the round. Then you get to attach those cute little ears! The Corset Coffee Cozy by Glamour4You is a great project to work on your tension. Since it laces up in the end, you can adjust if needed. Practice changing colors with the Edward Beanie by BrianaK. 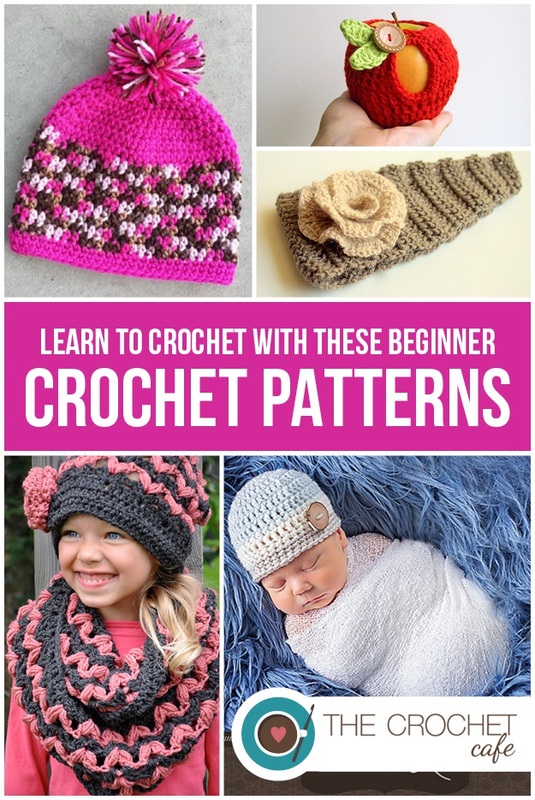 If you are not a crocheter already, I really hope you will try some of these patterns. If you already crochet, refresh some of your skills. Let me know how it goes!